Grab these foods when you're feeling hungry and want to eat larger portions without overdoing it on calories. There are some days where my stomach feels like a bottomless pit. Even after eating a satisfying meal—I'm still feeling snacky. I have days where it feels like my hunger rages All. Day. Long—no matter what I eat. I have a feeling some of you out there can relate...please tell me I'm not alone. When I know I'm going to be eating more than usual, I try to choose foods that are low in calories and still help satisfy my cravings. I want foods that I can eat a lot of—think big bowls and servings—and that won't leave me feeling slugglish and bloated afterwards. 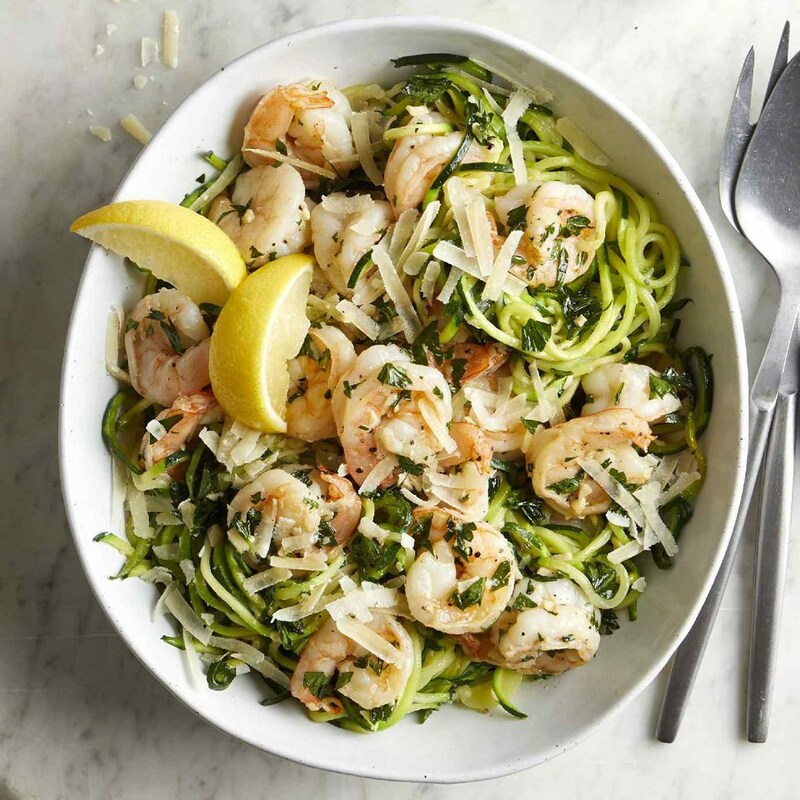 I'm not suggesting you throw portion control to the wind every day—but here are some good options to fill you up that deliver satisfaction (and nutrition) on fewer calories for days when you're feeling hungrier than usual. Popcorn totally satisfies a craving for a salty, crunchy snack. Yum. 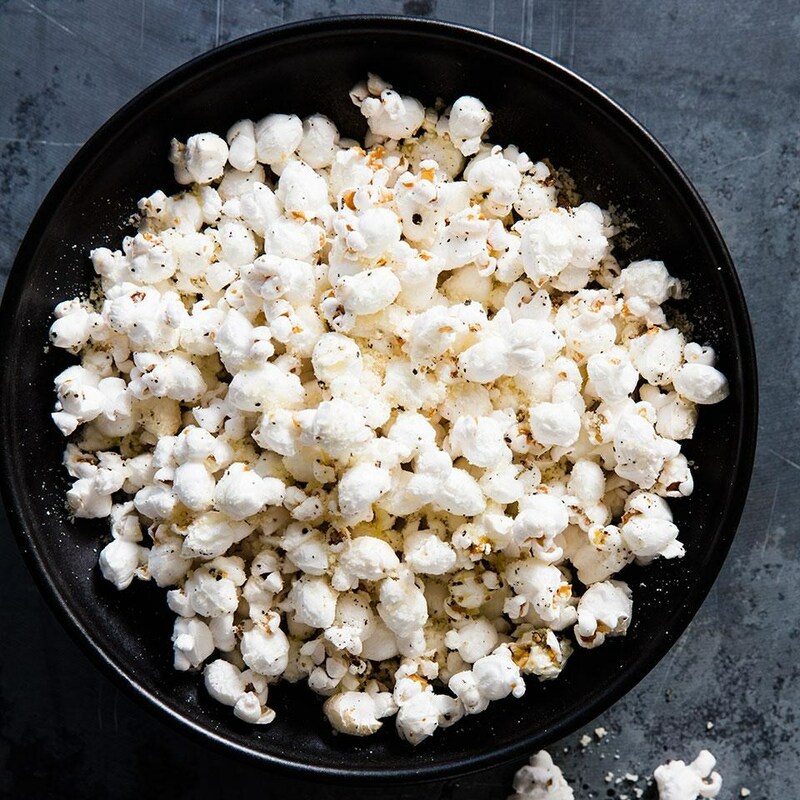 Foods that are filled with air, like popcorn, trick us into thinking we're eating more, according to Barbara Rolls, Ph.D., author of The Ultimate Volumetrics Diet. I love EatingWell's Lemon-Parm Popcorn, which is packed with flavor and delivers just 99 calories in 1½ cups. As a bonus, popcorn counts as a whole grain. Most of us don't eat enough whole grains, which deliver more fiber than refined grains. Air-popped popcorn is the lowest calorie choice and be sure to avoid popcorns that claim to be "movie-theater" style, as they tend to be high in calories and sodium. Broth-based soups are "souper"-filling, since the liquid adds lots of volume for just a few calories. That means you get to eat a lot more of it—so go for the black bean soup instead of the refried beans if you want to dish out a larger serving. Or make yourself a big bowl of vegetable soup for lunch or even a snack. Slurping down a bowl will definitely help tame your hunger. Plus, according to an Obesity Research study, women who ate low-calorie soup twice daily for a year lost 50 percent more weight than women who ate the same number of calories from energy-dense snacks. 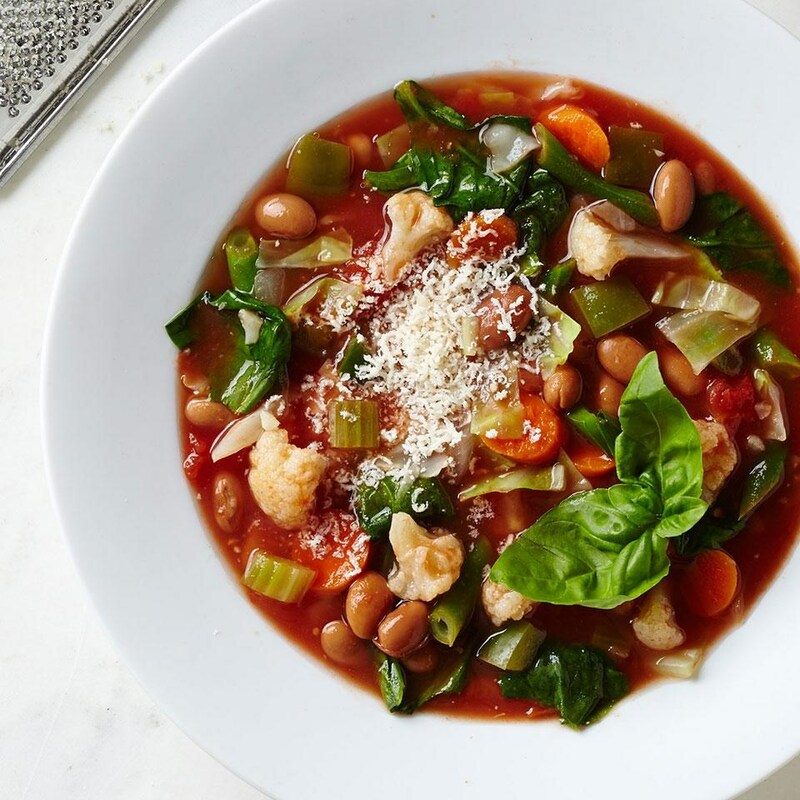 Try this Veggistrone soup (a riff on a popular Weight-Watchers recipe), which has only 169 calories in a 2-cup serving. I love celery. I often eat it a lot for a snack slathered with peanut butter. And I especially love it as a low-calorie standby when I'm feeling ravenous. One large stalk of celery has 10 calories but also provides one gram of fiber—so 10 large stalks would provide 10 grams of fiber for only 100 calories (and that's A LOT of celery). Eating fiber-rich foods helps you feel full. 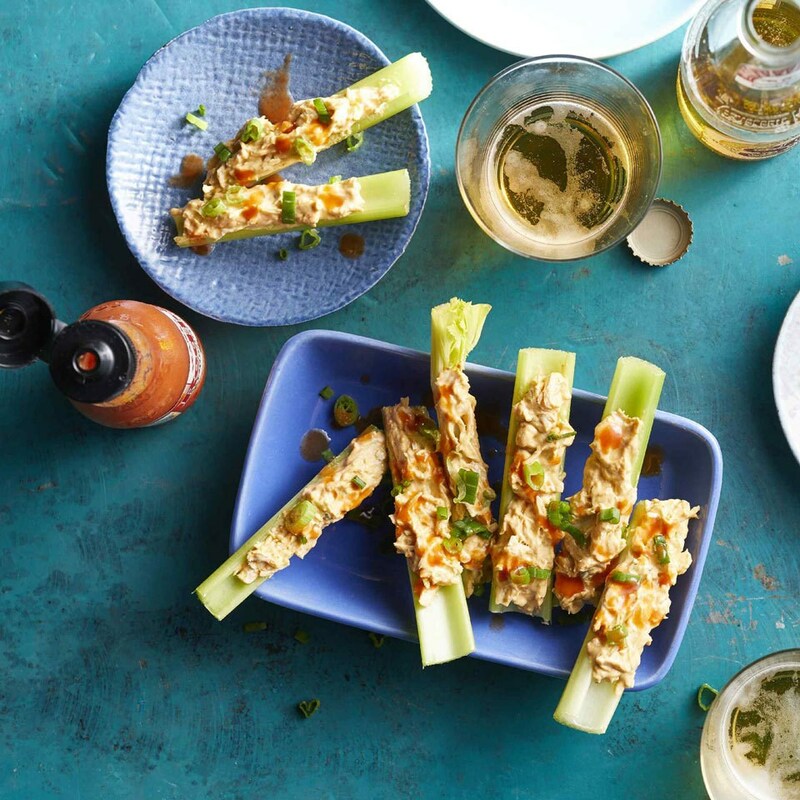 Go for the classic celery with peanut butter, or us it to scoop up yummy dips like in our Buffalo-Chicken Celery Sticks. Other crunchy raw vegetables, like bell peppers and cucumbers, are great options for a snack. Carrot sticks are slightly sweet and can quell a desire for something crunchy. And at 25 calories per medium carrot, you can eat a lot carrot sticks! Vegetables are generally lower in calories per volume than proteins and grains—so if you want to eat a bigger meal, jam it full of vegetables. Non-starchy vegetabeles, like greens, lettuce, zucchini, cucumber and peppers, are all super low in caloires but deliver lots of nutrients and fiber to fill you up. Even starchy vegetables—like winter squash, corn, peas and potatoes—have fewer calories than most foods. One medium baked potato has 160 calories (and four grams of filling fiber) and one cup of cubed butternut squash has 80 calories and 7 grams of fiber. One study found that when women ate either plain rice or rice with added vegetables, those who noshed on the veggie-filled rice downed 41 percent fewer calories and felt more satisfied afterward. And there are lots of creative and fun ways to add more vegetables to your meals. Try making veggie "noodles", cauliflower "rice" or just using vegetables to bulk up your meal by adding them to stir-fries, omelets and pasta dishes. Frozen-fruit pops are great because they help tame your sweet tooth and are generally pretty low in calories. Plus, have you ever tried to eat them too quickly? Brain freeze! This frosty treat forces you to slow down and be more mindful. 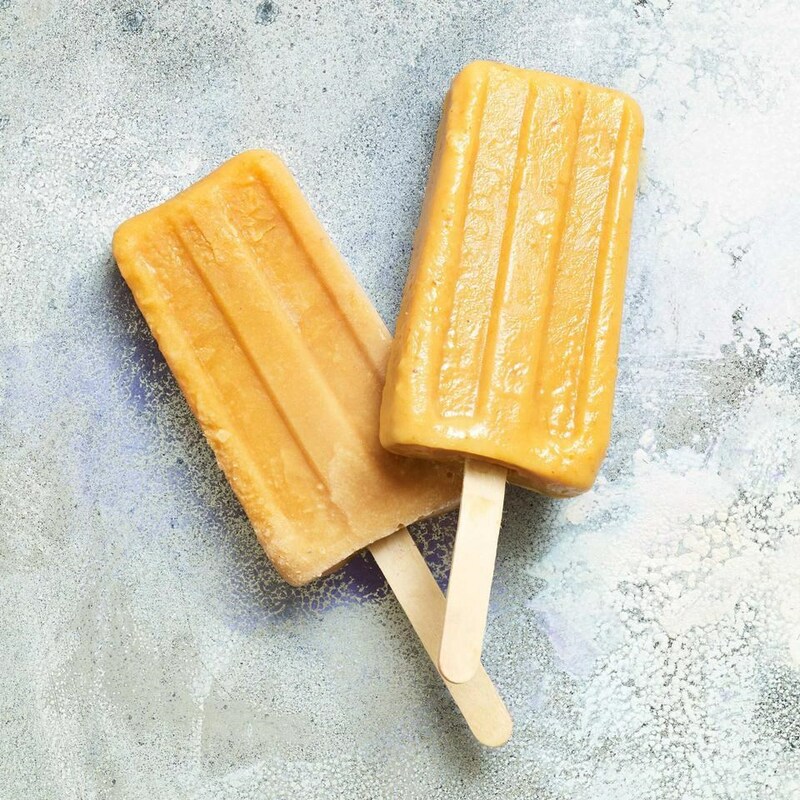 These Peach-Yogurt Pops have less than 100 calories and are made with nutritious real fruit and yogurt with a touch of sweetener. Buying them at the store? Look for ones made with real fruit that clock in at 100 calories or less.